Another review found lost down the back of the sofa - Gus Van Sant's Harvey Milk biopic. 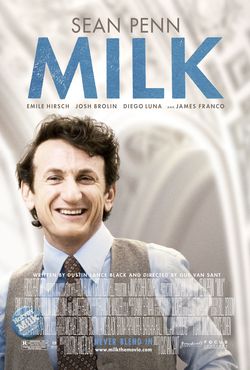 Milk (2008) was actually the first Van Sant film I'd seen, but it's GSV in relatively conventional mode. It's a biopic of Harvey Milk, the first openly gay man to achieve elected office in California, who helped mobilise people against a proposed law (the so-called Briggs Initiative) which would have essentially allowed anyone who either was gay or was supportive of gay rights to be sacked from schools. Tragically, he was assassinated shortly after this victory. The film itself is a really nicely done ensemble piece, with Sean Penn convincing enough as Milk that you almost forget his macho reputation. The splicing in of real footage of San Francisco, its gay scene and its persecution by the police, lend their realism to the reconstruction of Milk's life. As an activist, Milk is also an inspiring example of how identity politics can mobilise support, especially when there's not only an existential threat of the kind that LGBT people faced in the 1970's, but also the possibility of successful resistance to that same threat.